The Analytical Imaging Facility has access to four Eppendorf microinjection systems that all essentially the same but differ slightly in vintage and functions. One system is typically installed on CCD#4. The others float from station to station. They may be used for microinjection or translocation pipette assays. Set up microscope as it should be set up for normal imaging. Set up microscope for phase contrast with proper Kohler illumination. o switch the injection mode from I1 or I2 to X for the older system or to Standby for the newer systems. If cells are growing on coverslips in culture dishes, there are three surfaces that the cells may be living on. They may adhere to the bottom of the plastic dish, to the bottom of the coverslip, or to the top of the coverslip. You must be focused on the cells on the top of the coverslip because the needle has access only to the top layer of cells. The simplest way to set a Z limit is to lightly touch the side of one of the cells. Then type the magic key sequence: set; z-limit; enter. or on the newer systems, just by tapping the "Limit" button. If this Z limit is slightly too high or slightly too low, you can modify the Z limit in fractions of a micrometer. To cancel a Z limit, . If you want to label the cells with a fluorescent dextran so you can see immediately the amount injected. Standard 0.5-1 mg/ml Dextran 10,000 MW lysine fixable (Molecular Probes; stays after fixation, handy for IF). You can go much lower with the dextran if your solution is extra thick (we have used about 10 times less when he was injecting DNA in the nucleus). Standard is 1:30 from 2 mg/ml stock. The container at the left holds more than 30 needles and is available commercially. The container at the right is a simple culture dish with plasticine (non-drying clay) to hold the needles so that the tips cannot be damaged. Needles may be coated to make them more slippery. Microloaders. 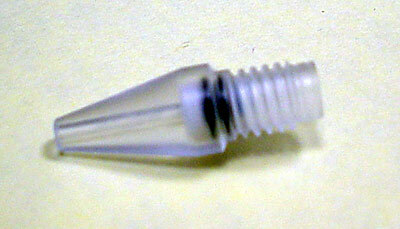 When in stock, we sell microloaders, which are specially thin pipette tips, for $5.00 each. We recommend you buy a box of Eppendorf order number 5242 956.003. Bring your own pipetteman to each session. Each needle will be filled with 1 to 3 ul. We do not supply the pipetteman because they walk off with users. Your cells must be on coverslips. These may be in just about any culture dish of your choice. But the bottoms of plastic culture dishes themselves are not flat enough for microinjection. Only glass coverslips are smooth and flat enough. The solution to be injected must be filtered with 0.1 or 0.2 um filters. 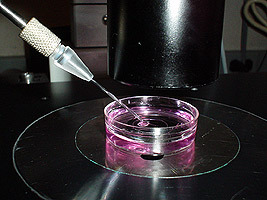 An alternate which may work is a high spin of the liquid to be injected. Two examples of filters are Corning disposable sterile syringe filters 21012-3 and Fisher centrifuge filters 09-719-31. Here's the official Eppendorf method: brinkman/prep.htm. The Dept. Anatomy incubator in the common equipment room is available for AIF use. All dishes in this incubator must be free clearly labeled with your lab and the date. The culturing hoods may be available by special request; do not use them without specific permission from the lab designated to the hood. Need to locate injected cells later? EMS sells Cell-Vu gridded coverslips(cat. no. 72264-23). 1-800-523-5874. There are coveslips from eppendorf. The name is CELLocate coverslips. Take HMDZ out of container by sticking needle through rubber stopper on top and cover rubber stopper with parafilm to keep sealed. Squirt 100ul of Hexamethyldisilazane into the bottom of the container. Label the container with date & time & HMDS added. Leave sealed overnight or longer. First time opening container of needles, do it in a hood to pull off unbound HMDZ. The AIF has lost a number of these grip heads for microcapillaries. They just simply disappear. This is a problem because 1.) when people need to do microinjection, there aren't any and 2.) they cost $50 each. Therefore, all microinjection users who use their own needles instead of the commercially available Eppendorf ones need to purchase their own grip head. We sell them at cost. Ask Michael in advance and he will give you a grip head in a labeled baggie (so you may clip it to your notebook). Mouneimne G, Soon L, DesMarais V, Sidani M, Song X, Yip SC, Ghosh M, Eddy R, Backer JM, Condeelis J. (2004) Phospholipase C and cofilin are required for carcinoma cell directionality in response to EGF stimulation. J Cell Biol. 166(5):697-708.